Each Freedom Paws puppy is born at either Freedom Paws, or in the home of a volunteer breeder caretaker. Each puppy is given individual attention from day one; including nail trimming, puppy petting, and neurological stimulation. Puppies will be exposed to a different situation daily, this may include flooring, noise makers, or sensory stimulation. This exposure will allow the puppies to learn how to handle stress as an adult dog. This is very important for an assistance dog, because as an assistance dog they will be exposed to many situations while working out in public. The puppies will be also petted daily by volunteer puppy raisers when they are at Freedom Paws. When the puppy is approximately four weeks old it will begin its earliest training. The puppy will begin to learn the most basic commands and body movements. It will also be exposed to wearing a vest and walking over different types of flooring. By the time the puppy is eight weeks old the puppy will know half of its commands and will be introduced to pulling a tire. The puppy will also be introduced to potty training and crate training. 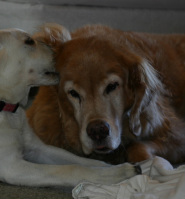 If you are interested in becoming a Breeder Caretaker for Freedom Paws click here to learn more. 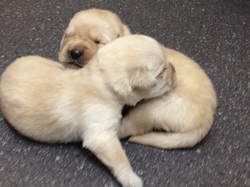 When the Freedom Paws puppy is eight weeks old the puppy will be put into a volunteer puppy raisers home. These puppy raisers are located anywhere in the United States, and are there to provide a loving home for the Freedom Paws puppy for 14-16 months. The puppy raiser is in charge of teaching the puppy over fifty commands and socializing the puppy by taking it out into public. Puppy raisers are also required to submit monthly puppy raising reports to Freedom Paws. This allows Freedom Paws to keep track of each puppy and to provide the puppy raisers with answers to any problems they may be having. Freedom Paws is also available to help with any training and behavioral issues the puppy may be exhibiting while in the puppy raising home. 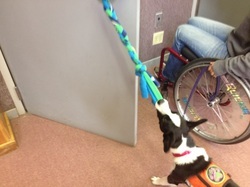 When the puppy is 14-16 months old the puppy raiser will return the puppy for advanced training to Freedom Paws. At that time the puppy will undergo temperament and health screenings to determine if the puppy is appropriate to continue in the program. If the puppy passes the screenings it will begin its training. At that time professional trainers will refine and finish the puppy commands. Then the trainers will introduce new commands such as "get it", "push", "light", and many other commands. Advanced training will last anywhere from 6-9 months. During Advanced Training and dog may exhibit inappropriate behaviors, or not pass a health screening. If this happens the dog will be "released" from the program. If the dog is able to be placed in another working role that will be priority. 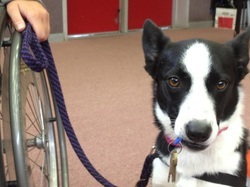 If not the puppy raisers will have first choice to take the dog back as a pet dog. If the puppy raiser for some reason does not want the dog back the dog will be adopted out to the general public. If you are interested in adopting a release dog please click here, or visit our Change of Career page. At this time Freedom Paws invites clients to our facility. Team Training is a 1-2 week training camp where Freedom Paws Instructors teach clients how to handle their new assistance dog. This is a very intense camp since the clients must learn how to care for, handle, and instruct their new assistance dog in just 1-2 weeks. At the end of the 1-2 weeks Freedom Paws holds a graduation to celebrate the new partnerships. The public is welcome to the graduation. Graduation is also paired with puppies being turned in for Advanced Training. Graduation is not the end. Graduates are required to fill out monthly reports for the first six months of their partnership. This allows Freedom Paws to fix any issues that may rise with the new partnership. After that the graduates are required to send in yearly reports, which include health reports. Every two years instructors will do follow ups and conduct public access testing to ensure the partnership is still working. Over the dog's working career Freedom Paws is always available to answer any questions, or resolve any issues the graduate may have. Retiring the assistance dog is up to the graduate. If a Freedom Paws Instructor notices that the assistance dog is slowing up the Instructor may ask the graduate to fill out a successor application to receive a second dog. Once the dog has been officially retired the graduate has the choice to keep the dog or give it back to Freedom Paws. If the graduate for some reason decides not to keep the dog the puppy raisers have the first choice to take the dog back. From there the dog gets to live the rest of its life in retirement.